March 7th, 2019 - Does My Bomb Look Big In This? 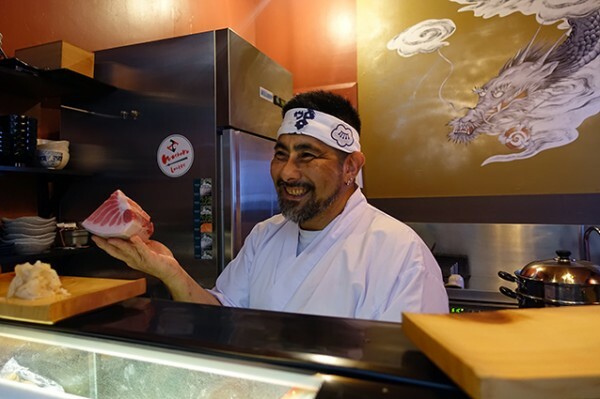 After carefully unwrapping it, Chef Kazu Nakatani shows us a marbled lump of tuna belly with a wide grin. He’s being a bit cheeky, showing us the nigiri sushi finale we’re missing out on by bailing on his Sushi Omakase Menu 8-pieces ($65/head) in, rather than going all the way to the 12-piece ($80/head) option. 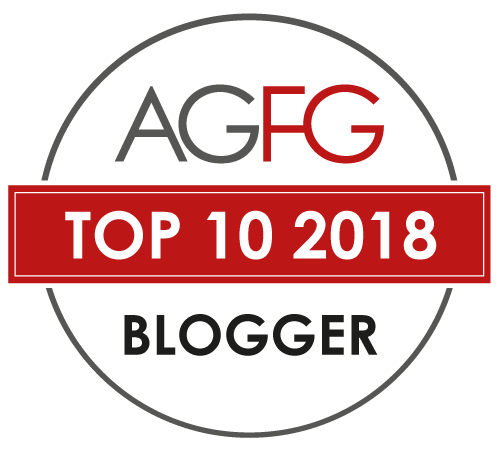 Nigiri sushi is the main event in his five-course meal that kicks off with market fresh sashimi, gathered each day at 7am when Kazu-san visits his suppliers at Sydney Fish Market. Most days you’ll find him posting a photo on the tiny restaurant's Instagram showing off the beautifully prepared and arranged bounty of the sea he’ll be working with that evening. Today it’s salmon and mild, almost sweet Imperador (alfonsino) from New Zealand, that suits the layered rice notes of the full-flavoured Black Bull Junmai Ginjo ($16/120ml) sake that I’ve chosen from their eight-strong list. Each day Kazu-san makes a simmered or cooked dish. Today it’s a wobbly square of goma dofu, that looks and has a texture like tofu, but isn’t made from coagulated soy milk. This creamy block is made from ground sesame paste, arrowroot starch and water, and it’s served with an egg yolk-coated prawn and frilly, green kale, in a mirin-based broth. While Kazu-san gets busy preparing his grilled dish, I take in the tiny restaurant. Arranged around his counter there are five stools. That number hasn’t been chosen at random. 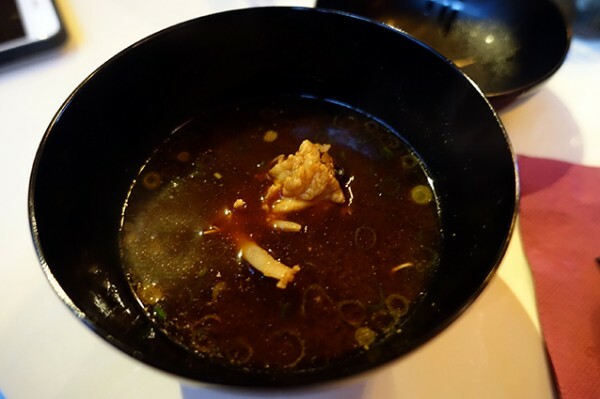 In Japan it is customary, especially in high-end Japanese cuisine, to have one itamae (cook/chef) in front of the board for every five diners. 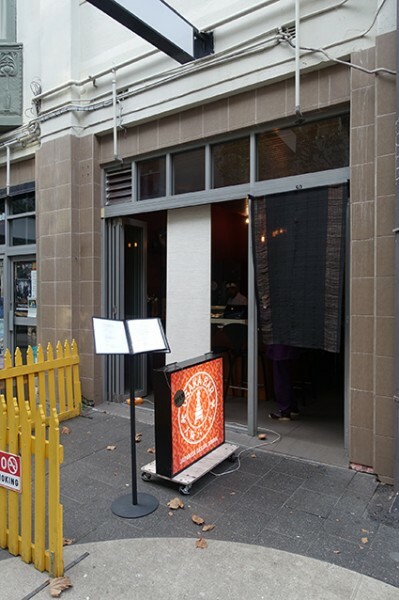 This tiny spot which opened last November, is a big change from Kazu-san’s former 50-seater restaurant on the other side of Llankelly Place. The smaller number of guests better enables the communication of culture with the cuisine. So, along with your tender, rare slices of grilled duck served on an orange slice with Kazu-san’s own sauce creation and nicely dressed watercress, you’ll grow to understand more about Osaka cuisine; Kazu-san’s relationship (his wife is on the floor taking care of dishes and drinks); seasonality and cooking techniques. Our soy sauce is taken away directly after the sashimi course. 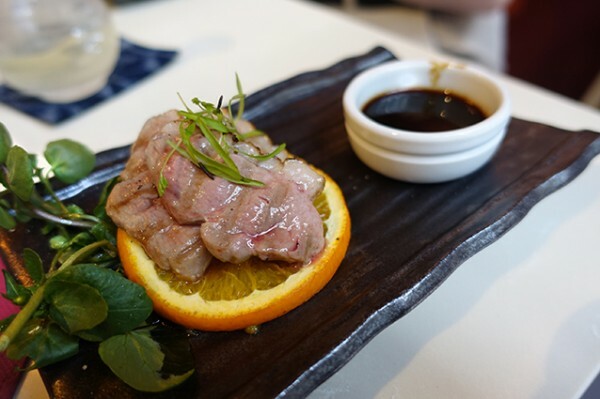 This places responsibility for seasoning of each fish firmly into the hands of the expert - your itamae – and ensures you fully appreciate the beauty of the red scorpionfish dressed only in sudachi (Japanese lime) and French salt. A perfectly-formed gleaming ruby boat of yellowfin tuna is made into a fish-on-fish double decker, with dried tuna powder sprinkled on top. 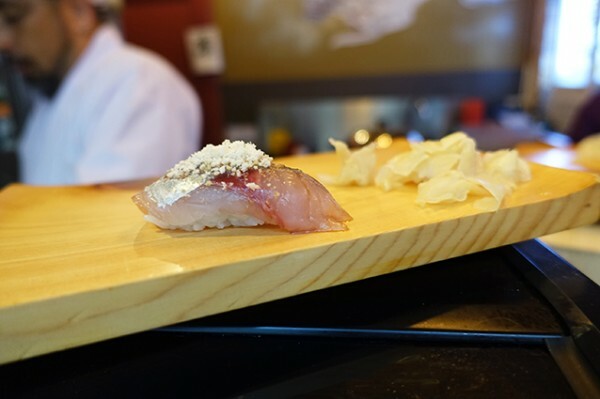 The delicate mound of yellow snow sitting on our yellowtail is kinako or roasted soybean flour, made from yellow soybeans. 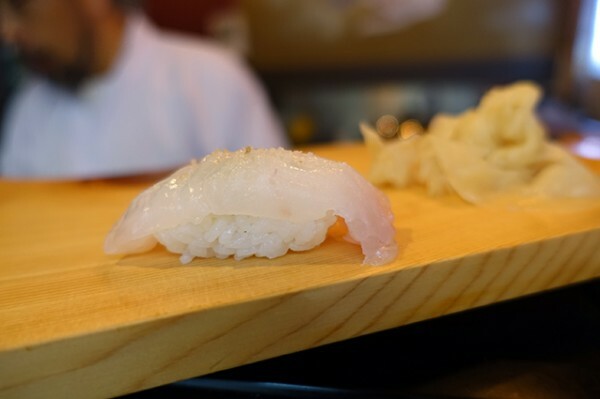 For those who hate using chopsticks, you’ll be pleased to note at Osaka Bar you’re presented with a sealed cloth handwipe, and all nigiri sushi made here is designed to taken in your clean hand and placed into your mouth in one bite. 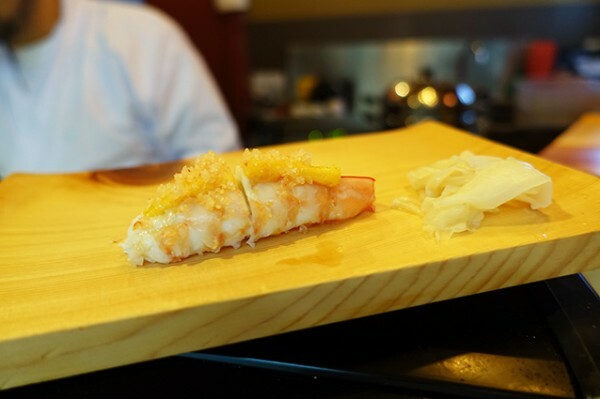 Kazu-san does cut the green king prawns into two pieces, which gives you two opportunities to appreciate his three-way prawn creation, made using his own home-made prawn soy sauce and prawn flakes. 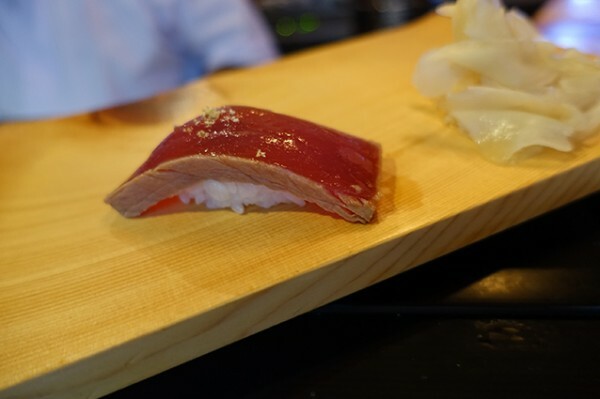 Next, the same tuna we ate earlier returns as akami zuké. 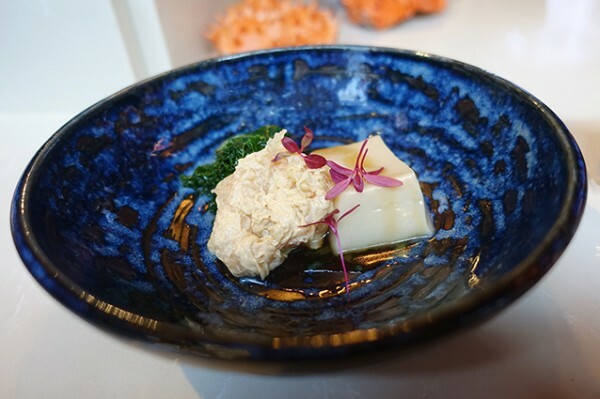 It's marinated in the Edo style (18th century), a time period when virtually all tuna was marinated to preserve it and keep it visually appealing. 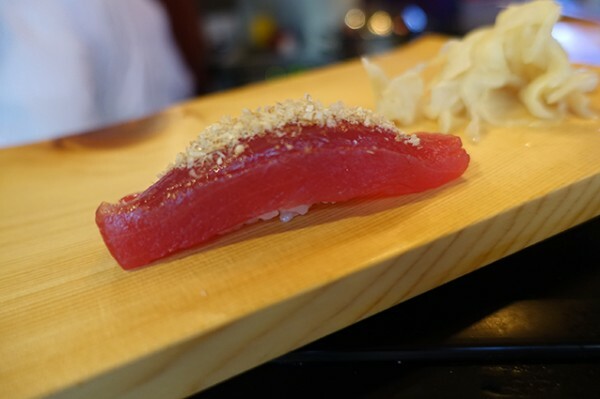 Kazu-san’s gleaming dark red-fleshed tuna certainly has visual appeal. 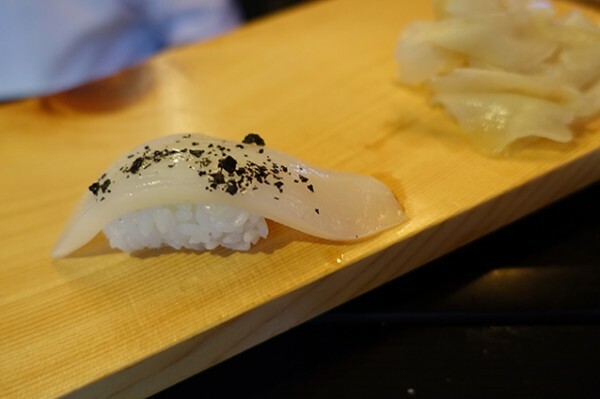 Cuttlefish is presented as a tender, delicately creamy arc adorned with volcano salt. Peeking out from underneath you can see the sushi rice. 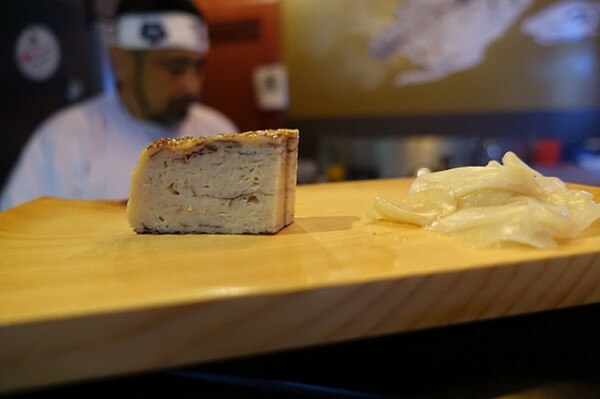 Kazu-san has chosen Haenuki rice from the Yamagata prefecture because it is still good when it gets cold – something that's important in a tiny, less fast-paced restaurant. 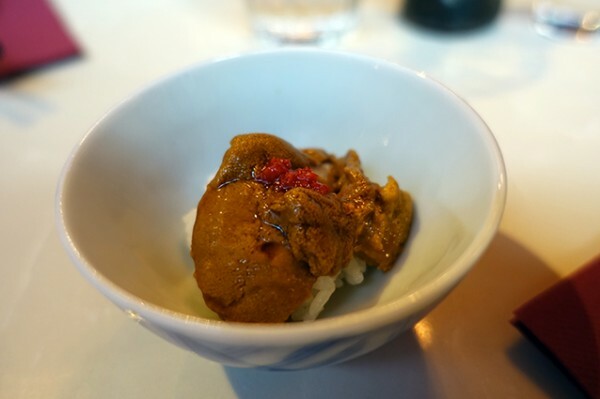 This sushi rice is particularly great under uni, the roe of long-spined sea urchin that has been given a blast of heat with yuzukoshō, a paste made from chillis, yuzu peel and salt. Finishing at the eighth piece mark (almost certainly a mistake, we should have pushed on to twelve) means we end on hiramasa kingfish topped with dried kombu (seaweed). With visible disappointment Kazu-san concludes our meal with a dessert of tamago (egg omelette) and a bowl of Kyoto-style miso. 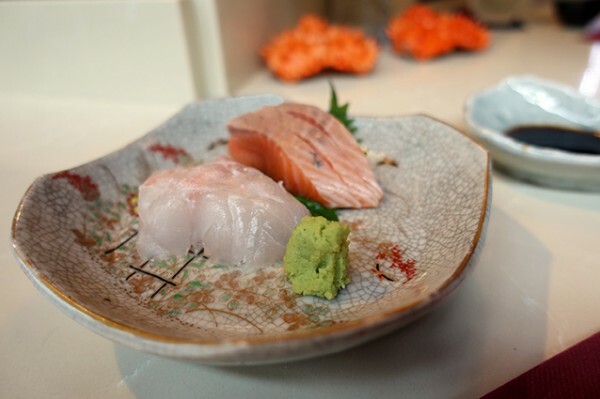 The dark red-brown miso uses the bones of the sushi fishes, neatly ensuring nothing goes to waste. 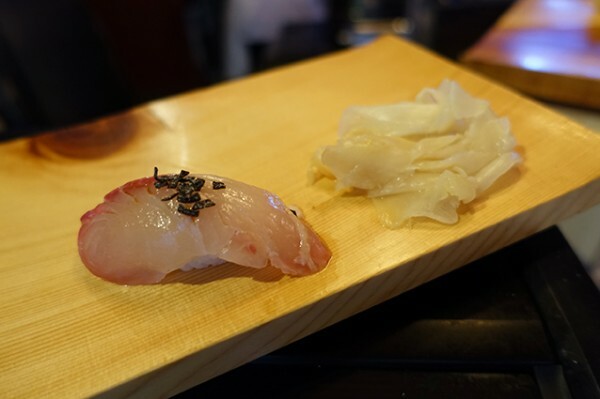 If you’re comparing sushi omakase experiences, what sets Osaka Bar apart from others I’ve been to, including Sashimi Shinsengumi, HaNa Ju-Rin and Shiki, is was the level of connection with the chef. 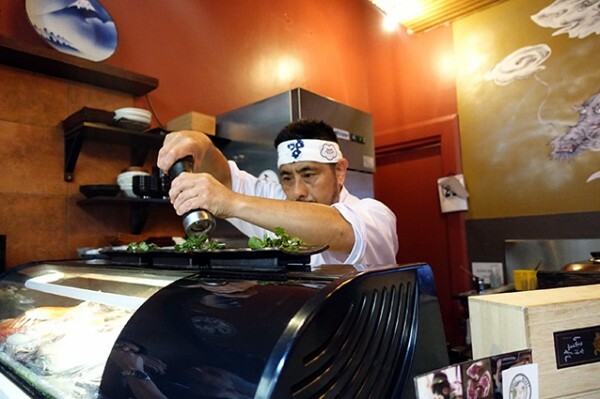 Kazu-san clearly thinks an itamae’s job is to communicate with diners, and that makes this experience a real treat. NOTES: You can see a review of this chef's previous restaurant back HERE. 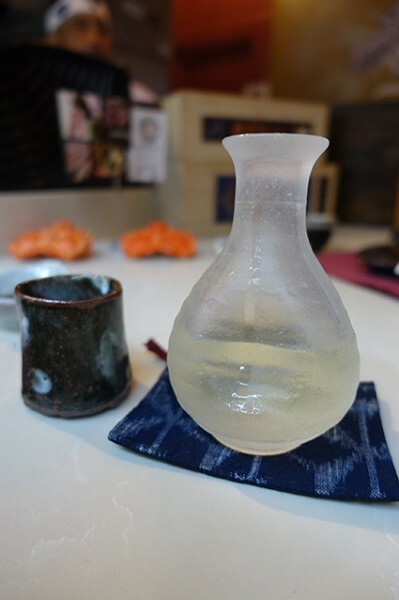 Book in via this Washoku Lovers link for a complimentary drink upon arrival.